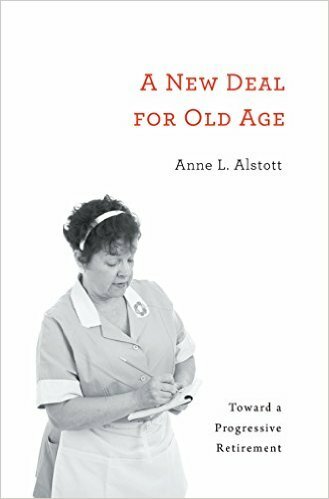 Please join author Anne Alstott for a discussion of her newest book A New Deal for Old Age, on Monday, April 11, 2016, at 6:10- 7:00 PM, SLB Room 129. Commentary will be offered by Bruce Ackerman, Sterling Professor of Law and Political Science. As America’s haves and have-nots drift further apart, rising inequality has undermined one of the nation’s proudest social achievements: the Social Security retirement system. Unprecedented changes in longevity, marriage, and the workplace have made the experience of old age increasingly unequal. For educated Americans, the traditional retirement age of 65 now represents late middle age. These lucky ones typically do not face serious impediments to employment or health until their mid-70s or even later. By contrast, many poorly educated earners confront obstacles of early disability, limited job opportunities, and unemployment before they reach age 65. America’s system for managing retirement is badly out of step with these realities. Enacted in the 1930s, Social Security reflects a time when most workers were men who held steady jobs until retirement at 65 and remained married for life. The program promised a dignified old age for rich and poor alike, but today that egalitarian promise is failing. Anne L. Alstott makes the case for a progressive program that would permit all Americans to retire between 62 and 76 but would provide more generous early retirement benefits for workers with low wages or physically demanding jobs. She also proposes a more equitable version of the outdated spousal benefit and a new phased retirement option to permit workers to transition out of the workforce gradually. Anne Alstott is the Jacquin D. Bierman Professor in Taxation at Yale Law School. Her other books include; No Exit: What Parents Owe Children and What Society Owes Parents (Oxford University Press, 2004) and The Stakeholder Society (with Bruce Ackerman, Yale University Press, 1999).